The itch to chase spring run steelhead trout hit me about the middle of last week. A large weather system moved across the Mid-Atlantic Tuesday night through Wednesday and it put a lot of creeks over their banks. Thursday morning, Lake Erie tributaries on “Steelhead Alley” were all blown out. I heard reports that there were still a good number of fresh steelhead staged in the lake prior to the wet weather and all I could think about was how many of these fish were moving upstream. By Friday, folks were posting videos from Walnut and Elk Creek on YouTube and Instagram and sure enough, fresh fish were being caught. Somewhere in the middle of all my internet surfing I came across a podcast by Washington D.C. fly fisherman Rob Snowhite. If you love to fly fish and you’ve never checked out Rob’s podcasts, I’d suggest you do. He’s got a lot of great content posted online that can fill long hours travelling to fishing destinations. 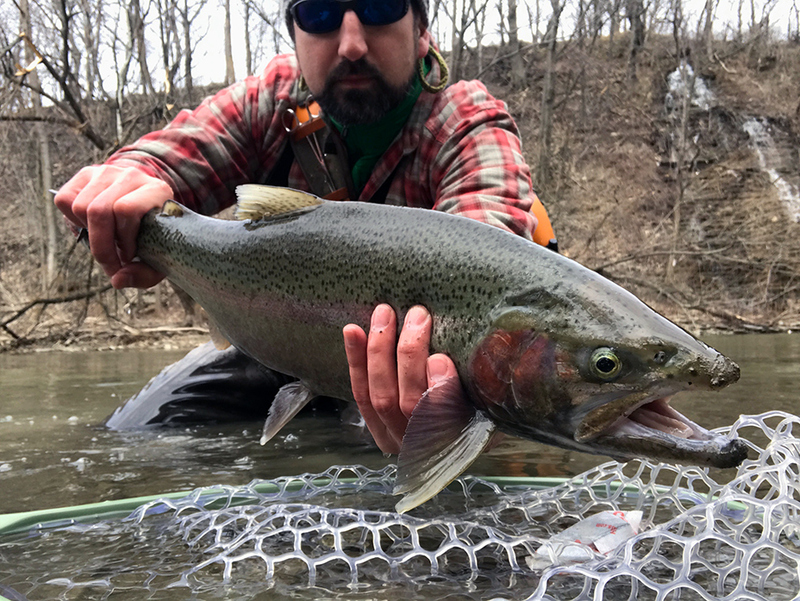 Each year Rob spends time fly fishing for steelhead in Ohio. In the podcast I came across he was talking with Dan Pribanic of Chagrin River Outfitters. After listening I made the decision I was going to explore Ohio over the weekend. On Friday evening I packed up my truck and started heading west on the Pennsylvania Turnpike. Ironically it takes about the same amount of time to drive to Cleveland as it does for me to drive to Erie. The drive was uneventful, except for the snow squalls I encountered after driving through the Kittatinny Mountain Tunnel. I drove in snowy conditions the rest of the way to Ohio. Once I was outside of Cleveland, I stopped at a cheap hotel and settled in for the night. Before I went to bed I did more research, looked at USGS gauges on all the major Ohio tributaries and decided that I’d first drive to the stream furthest west, the Vermillion River (“the Vermillion”). The temperature on Saturday morning was below freezing when I woke up. Like I’d done in Erie a couple weeks back, I figured I’d take my time and let things warm a bit even though the high was only to be 32. After breakfast I drove to the Vermillion. The Vermillion is a solid 45-minute drive west from downtown Cleveland. The river is named after a shade of the color red, which is the color of the river after rain causes the soft red clay substrate to dissolve into the flowing water. Like with many of the Ohio tributaries, there are many parks that make fishable water accessible. I decided to enter the river at the Mill Hollow Bacon Woods Park. When I arrived at the parking lot off of Vermillion Road I didn’t see many cars and as I glanced further into the distance, I could see why. The Vermillion River was colored vermillion. The water was moving swiftly and would have been risky to wade with no real way to read the water. I was disappointed and wondered how I could have misjudged the USGS. I walked down to the water, stood on a rock and marked a spot for a future trip with better water conditions. Knowing that I’d be dealing with tough water conditions I thought back to the Rob Snowhite podcast I’d listened to. In that podcast he mentioned the Rocky River (“the Rocky”). This river is the smallest of the major Ohio tributaries but is world renowned for having excellent steelhead fishing. I figured that maybe its smaller description might mean it’d be fishable sooner. The Rocky River flows through the Cleveland suburb of Lakewood and is criss crossed by highway bridges, although there is a good amount of parkland that immediately surrounds the water. I set my sights on the Memorial Field Park as it looked like easy access on Google Maps. When I arrived at the park I was greeted by high and muddy water, although I did observe quite a few cars. It turns out that a local angling group was conducting a “kiddie fishing rod steelhead tournament.” Apparently it was a “good conditions or bad” event because the water was ripping at the Valley Parkway Bridge. I parked and walked down to the bridge. There were about ten guys there casting two foot long kiddie rods and trying to get their line to go anywhere near the bottom. I didn’t see anyone come close to catching anything. I did however talk to a local who guessed the run below the bridge held many steelhead. With another steelhead stream too high to fish, I headed back to my truck and kept driving east. The next body of water on my list was the Chagrin River (“the Chagrin”). The Chagrin flows into Lake Erie after meandering through the Chagrin River Park, and before that, through the wooded suburbs of Cleveland. The upper Chagrin offers miles of fishable water that flows through beautiful suburbs with giant homes and backyards. I set my GPS to take me to the Hunting Valley area and when I finally saw the river for the first time, I was shocked to find it wasn’t near as high as the Vermillion or Rock River. The Chagrin was still off color, but it was definitely fishable. At the first bridge I came to, I found a small lot next to a walking trail that was filled with several trucks. I drove over the bridge and saw three guys swinging fly lines upstream. I paused for a second after I crossed the bridge and just didn’t have the desire to fish the unfamiliar muddy water. I decided I’d keep driving east and see if the Conneaut Creek was in even better shape than the Chagrin. The Conneaut Creek (“the Conneaut”) begins in Pennsylvania and flows through Erie County until crossing into Ohio and eventually dumping into Lake Erie. There isn’t a ton of readily available information online about Conneaut Creek access in Ohio. The Ohio Department of Natural Resources lists two primary areas, close to the mouth, and upstream around the Center Road area. Although these are the only two areas listed, I believe these is quite a bit of water that can be accessed and fished, but as always if you’re not sure, don’t trespass. When I pulled onto Center Road I could see glimpses of the water in the distance and I could immediately see that the Conneaut was blown out. I was expecting to find lower water but of course rain doesn’t fall evenly across a large storm front and the area must’ve received more rain. I decided to stop and quickly eat a sandwich while watching the murky water swirl. After thinking about it, I decided I’d leave my first Ohio steelhead to another day and I focused on heading back into Pennsylvania to fish the Erie tributaries I know. I called Poor Richards Bait & Tackle and they confirmed that Elk Creek was still unfishable but that Walnut Creek and the smaller east side streams had been fishable for a day or two. 20 Mile Creek, the last stocked tributary in Erie County before crossing into the state of New York typically clears well before other streams. I’d fished 20 Mile in my last trip with the Fuddy twins and Mike Haines and it had seen some good runs of fish. I made up my mind to head there and fish until dark, and if I found fish, I’d stay the night in Erie and fish Sunday as well. Looking downstream on 20 Mile Creek just above the Rt. 90 Bridge. I arrived at upper 20 Mile Creek (“20 Mile”) around 1:30PM on Saturday afternoon. I pondered if I’d wasted time in the morning driving across Ohio but I chalked it up to gaining knowledge for the next time I made the trip in better conditions. The wind was blowing and it was cold for April. I bundled up, rigged up my 10’-8wt with a 9’-4X leader and tied on a white woolly bugger with a squirmy wormy pattern dropped off the hook bend. I was the only car in the 20 Mile Creek parking area, which was hard to believe for a Saturday. I headed down the footpath into the shale canyon and ended up at the base of the Rt. 90 Bridge. In the deep run on the other side of the bridge I spotted a large steelhead and drifted several times in front of him. He didn’t blink and I decided to let him be and move downstream. As I walked downstream I followed the main current on the east side of the stream and eventually found a run that held good gravel, which attracts fish. In the deeper green water I could make out shadows of steelhead. I drifted my set-up and after a third drift I felt my line go tight and I was hooked up with my first steelhead of the trip. This fish fought well and took me downstream into a long set of rapids. I was able to land this fish and my adrenaline was pumping. Because of the wind up top I’d decided not to film any fishing with my video cameras. This turned out to be a mistake. As I moved further downstream and the slate walls rose above the water, the wind ceased to exist, and the fishing got better. In the first deep run I tossed my line out and almost instantly my line went tight and I made out the flash of a steelhead as it took my squirmy wormy pattern. It was a beautiful fresh chrome hen. Another 75 yards downstream I fished a good hold at the bend and after a couple of casts my indicator darted under the water and I set the hook. It was another fresh fish and it fought like it. One of my favorite things about steelhead fishing is fishing a hole or run where you don’t know if there are fish and then suddenly something takes your line, it’s an amazing feeling. The first steelhead I caught on Saturday afternoon. She made a couple of blistering runs! The large male steelhead I caught downstream and around the bend. I ended up walking about half way down through the Tomato Patch section and saw very few fish further downstream. Eventually I turned around and made my way back to the last place I’d caught a fish. I took anothher drift through the same run and after few drifts on the opposite side of the hole, wham, a large buck steelhead had run out and grabbed my white woolly bugger. As I was fighting this fish, I realized two younger fellas were watching me from upstream. The fish started taking me downstream and as it did, these two fellas moved right into the spot I’d been fishing. Eventually I landed him and he was a colored up male. After catching that fish it was getting late in the afternoon and I decided to call it a day early and head back to a hotel for some sleep. The next morning I woke up early and decided I’d head back to 20 Mile Creek with my camera gear in hand. It was extremely cold for April again. I arrived around 7:00AM and I parked in the same area I had the day before and walked down to the Rt. 90 Bridge. In the deeper water just before the bridge the water was green and you couldn’t quite see what might be lurking there. I tied on a white crystal flash woolly bugger and tossed it to the head of the pool and let it drift down with the current. Immediately my indicator shot under the water, paused, then went deeper. I set the hook and my line snapped. I looked at my line and it was clean cut just above where my woolly bugger had been tied on. I was fishing with 4X Rio fluorocarbon tippet. Large steelhead do have hard jaws, not to the extent salmon do, but they can break tippet if it moves across their mouth in the right direction. I tied on a second white crystal woolly bugger. On my second drift through the pool, my line was jolted again and this time I was hooked up on a large fresh hen. I could see the bugger in her mouth as she came to the surface and barrel rolled. She started violently shaking her head and then was off to the races. First she went downstream and then upstream. When you are fighting a steelhead, you need to be ready to reel line in very quickly and then just as quickly let it back out. It was a wild ride! I eventually landed the hen and she had beautiful shining chrome sides. I ended up fishing that pool for an hour or so and landed quite a few hens and bucks. The beautiful colors of a spring run steelhead. A hard fighting buck from Sunday morning. There must’ve been 30 steelhead in that short run. I suspect they were the fish that I’d run into while walking downstream the day before. They all ran upstream overnight and had come to rest before the Rt. 90 Bridge. After the fish weren’t interested in what I was showing them I walked upstream. I hiked all the way to the upper 20 Mile parking lot area. I did hook into two good fish along the way and both threw my hook after a short fight. The water had dropped considerably since Saturday and it was clearing as well, which wasn’t good for the fishing. After walking upstream, I decided to hike all the way to the bottom boundary as well. This proved to be uneventful. I saw one fish during the entire hike, although I’m sure there were a couple of fish hunkered down in deep water or blow downs. Regardless, there were no numbers of fish downstream. As it got later into the afternoon I decided it was probably time to head back towards southeastern Pennsylvania. Amazingly, I only ran into one fishermen on Sunday, an older gentlemen who was throwing eggs on a spin rod. He caught and kept a couple of fish just below me. Lower 20 Mile Creek in the Tomato Patch section where there wasn't much happening. As I walked back upstream to my truck, I thought of Elk Creek and that it was probably just coming to a fishable level. Then I thought about Ohio and how Monday and Tuesday would probably bring incredible steelhead fishing to some lucky retired gentleman or some guy who works nightshift. If only I had more time to fly fish. I did come to one conclusion and that was that I’d be back to Ohio some day. After a thirty-minute walk I arrived back at my truck. There were several gentlemen just arriving to fish. I stopped and chatted with a gentleman from New Hampshire that was visiting. He asked how the fishing was and I told him there was nice group of fish down below the bridge but that he’d have to work for them in the clearing conditions. He chuckled and smiled and said he’d give it shot. I broke down my gear, changed my socks and warmed my hands. I hit play on a long list of songs and put my truck in drive and headed back home.